A behind-the-scenes look at our studio and our people. Regard sur les coulisses du studio et son équipe. A playspace for experiments, snippets, and doodles! © COPYRIGHT MMXVIII CARTOON NETWORK STUDIOS & DOVE. ALL RIGHTS RESERVED. The Dove Self-Esteem project is a wonderful initiative to spread positivity and awareness related to issues of body image and personal confidence. This series of PSAs features the cast of the show Steven Universe acting out and teaching some of these valuable lessons on a commercial set. 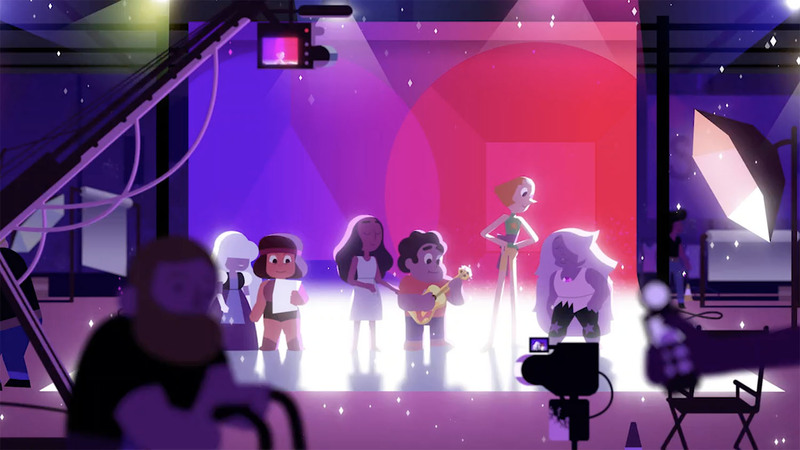 In addition to the informational pieces, there is also a music video encapsulating the overarching message with the main cast singing an original song written by Rebecca Sugar, the series creator, called “We Deserve to Shine”. Because we love working with so many different artistic talents, this series gave us the opportunity to feature a different storyboard artist for each segment. From concept to completion, our whole team was able to shine on design and animation and compositing! EUSONG: Rebecca had a very specific feeling in mind when she pitched this project to us. She crafted the stories and messages along with Dove, and she wanted us to find a way to capture her characters behind-the-scenes, being themselves. She referenced some early improvisational acting tests between Kermit and Fozzie that were done for the Muppet Movie as a starting point. We also wanted to use realistic camera movement and focus effects to give an authentic live action feel. The most important part though was to nail the characters’ acting and performance. We pushed the animation team to focus on rhythm in gestures, and emphasize the delivery of the lines and hitting some clean poses. Even though our designs are very graphic, we wanted to make sure the movement still felt like it occupied a 3D space. One specific challenge with this project was the length of the shots. Because it’s meant to feel like a single continuous take, we had to pick strategic places to break up the shots in a way that felt natural. The compositing team really helped with weaving it all together to have a nice flow. JASMIN: A lot of our team, including myself, have actually worked on Steven Universe, so finding a way to adapt the style was very natural. In our treatment we took away the outlines to make it more graphic, but still use a lot of the iconic shape language from the show like the pill shapes and diamond sparkles. Each segment has its own color scheme which is based on the featured character, like how Peridot’s set is primarily green. As part of the Steven Universe / Dove Self Esteem Project, Rebecca Sugar created an original song that encapsulates the entire message behind the project–we all deserve to shine! 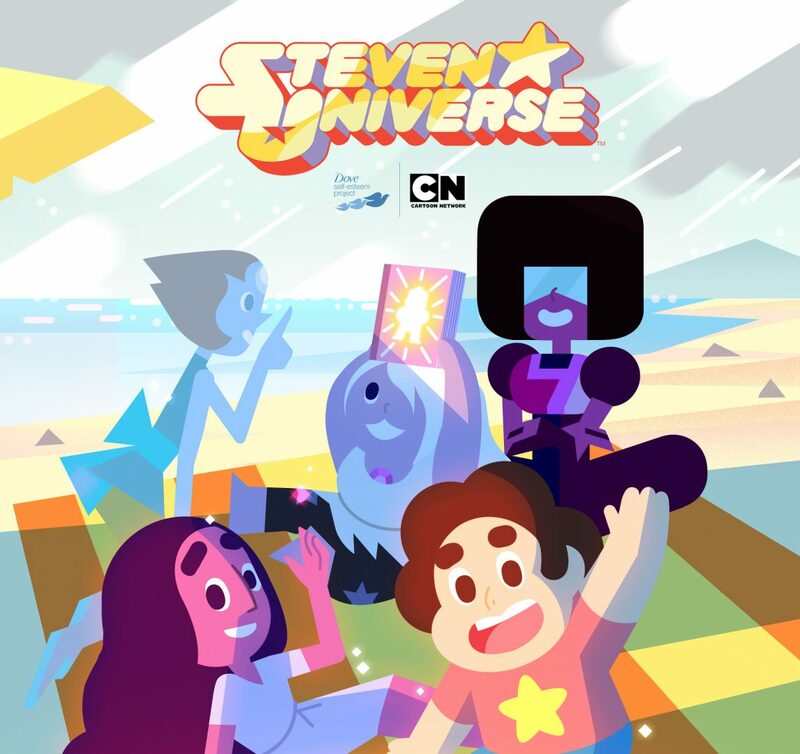 With appearances by a lot of the main cast, Steven Universe storyboarder Lamar Abrams came on to board the music video, choreographing the Gems and their transformations in fun and endearing ways. With the help of our talented design, animation, and compositing teams, this became a perfect thesis statement for the series. For the first spot in the campaign, we enlisted the help of Elizabeth Ito to storyboard the short, titled “Teasing and Bullying,” which stars Amethyst and Jasper. This was an exciting one because it was our first Curriculum, so it was new territory for us. Additionally, it gave both Elizabeth and our animators the chance to work in a space that had both strong emotional acting as well as a bit of fun action when Jasper destroys the set. The piece set the groundwork and the overall style for all of the other shorts to come! When it came time to approach our second Curriculum, “Competing and Comparing Looks”, we brought in Tiffany Ford to storyboard the piece. While this one didn’t have the set-destroying aspect of the first, it did carry emotional heft while allowing Tiffany the room to have some fun with the characters’ unique talents (whether Sardonyx is spinning like a top or Smoky is showing off some yo-yo skills) and even whip the camera around the set, giving us a chance to introduce new camera movements and explorations of the set space into the Curriculums. The third Curriculum was the first to feature only one Steven Universe character, Peridot. To handle this new challenge, we reached out to Hanna Nyström to storyboard. In this acting-heavy one, titled “Media and Celebrities”, Hanna had the chance to have Peridot bounce around the set interacting with both a floating tablet as well as a floating camera, which was really fun to execute and it introduced another dynamic movement to the Curriculum series. For the fourth Curriculum, titled “Body Talk”, we invited Seo Kim to tackle a piece that was just as short as the others but jam packed with content! Along with the emotional journey taken by Bismuth and Pearl, we had the chance to create designs and animate the building of a whole new set within the set (a worthy counter to the set destruction in Curriculum 1!). Seo’s boards helped guide our design, animation, and compositing team to a big impressive set piece (literally!). JASMIN: “Your Magic Mind and Body” is an educational e-book we made as a part of the Dove campaign. It’s customizable to the reader a show the Crystal Gems teaching humans how to feel confident about themselves. Eusong laid out the ideas for each page and I fleshed them out in the style of our other Steven Universe designs! EUSONG: I tried to find a way to keep the illustrations in this book a bit more abstract while still clearly communicating the message on each page. Luckily I was working with Jasmin, so I could keep the ideas rough, knowing that she would be turning them into final designs later!